Stephen King is best known for being the creator of nightmares for generations. His horror novels are some of the bestselling and most well-known books that have ever been written. What the general public may not realize is that there is much more to Mr. King than spooky stories. One of his more recent undertakings has been the Bill Hodges trilogy, a set of novels that focuses on a retired police detective. I read the first book Mr. Mercedes last year and completely fell in love with the story. King crafted a solid thriller with a flawed but endearing protagonist and terrifying bad guy. Devoid of his usual haunts, Mr. Mercedes showed how horror could invade the real world. Finders Keepers, the second novel in the trilogy, begins with a completely new set of characters. In the late 1970's author John Rothstein has become known more for his seclusion from the rest of the world than the brilliant novels he wrote years earlier. After all of the acclaim of his writing, he completely disappeared from the public eye and stopped producing new works. Now there are three masked men inside his isolated home. They immediately go to the large safe that houses all of the cash that Rothstein has stowed away. One of the thieves seems more interested in the more than 150 moleskin notebooks in the safe. The money is valuable, but the price of the unpublished writings inside these notebooks could have a much greater significance. The first part of the book alternates between the flashbacks of the Rothstein robbery and aftermaths with the much more modern story of thirteen-year-old Peter Sauber. Peter's family has had a tough time since the financial crash of 2008. Their financial woes are compounded by the debilitating injuries that their patriarch suffered during the heinous attack that was detailed in the opening of Mr. Mercedes. While walking through the brush between the local recreation center and his home, Peter discovers a trunk buried into the roots of a tree. Inside he finds $20,000 in cash along with countless moleskin notebooks. This could either be the salvation his family needs or the beginning of something much worse. Bill Hodges doesn't appear until the second half of the novel. Several years after the events in the previous book, he has started his own private investigation firm and taken a much more proactive outlook on his health and life. He is still haunted by the crimes of Brady Hartsfield, the psychotic mastermind behind the crimes of the last novel. Hodges gets drawn into Peter Sauber's story when Peter's sister comes to his office. 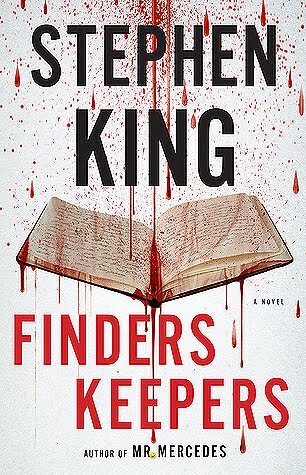 While not as engaging as Mr. Mercedes, Finders Keepers is still a worthy a read. The story here is mostly new, meaning that it could probably work as a standalone. Still, I'd recommend starting with the first book so that you pick up on all the pieces that connect the two. I don't think I've ever read a bad book by Stephen King. His characters are strong, the plot moves quickly, and the mystery is strong. All that said, I couldn't help but feel like something was missing from this one. The villain was never as terrifying as Brady Hartsfield, and the conclusion seemed a bit inevitable to me. Nevertheless, I was glued to the pages and completed the novel in just a few sittings. The book ends with a brief tease of what promises to be a thrilling conclusion in the next story, so I'll definitely be picking up End Of Watch soon. This entry was posted on Tuesday, March 27, 2018 and is filed under Book Review,Finders Keepers,Mr. Mercedes,Mystery,Stephen King,Thriller. You can follow any responses to this entry through the RSS 2.0. You can leave a response. I can't wait to read the last one! King scares the bejesus out of me. I can't even watch the films any longer. I think the books would be even more horrifying for me. Aside from that, I am glad to hear this was a worthy addition to the trilogy. These might be perfect for you because they aren't horror! King as written good old fashioned mysteries here!